APARSEN was a Network of Excellence that brought together an extremely diverse set of practitioner organisations and researchers in order to bring coherence, cohesion and continuity to research into barriers to the long-term accessibility and usability of digital information and data, exploiting diversity by facilitate the building of a long-lived Virtual Centre of Digital Preservation Excellence. The objective of this project may be simply stated, namely to look across the excellent work in digital preservation which is carried out in Europe and to try to bring it together under a common vision. This project received funding from the European Union’s Seventh Framework Programme for research, technological development and demonstration under grant agreement no 269977. Research into digital preservation is often done in silos – silos of either topic or project. 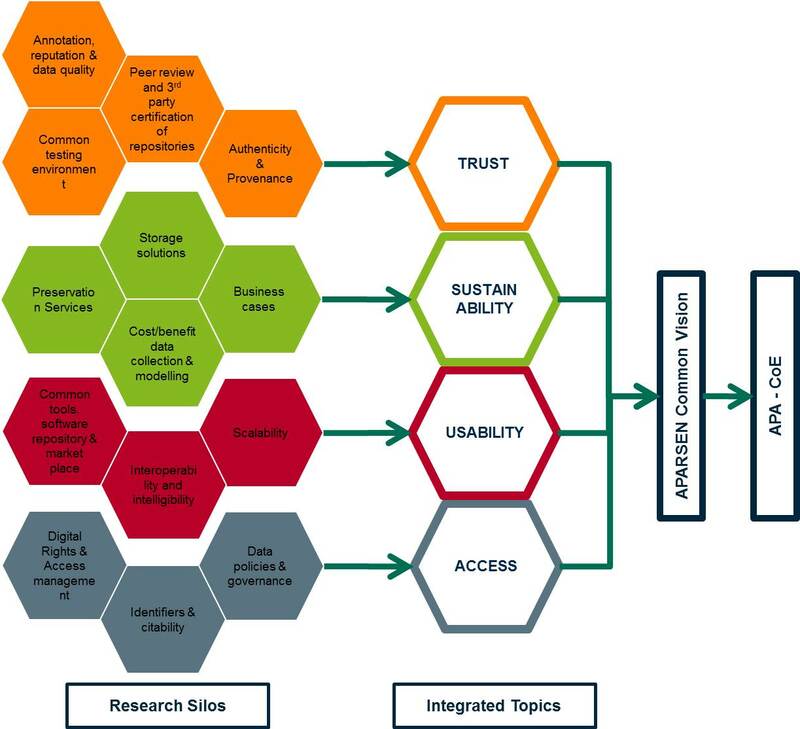 Our approach is to identify research areas which can be integrated into broad topics. These broad topics are then merged successively into a common vision. Merging the outputs form different projects is tackled from the point of view that all of the work being undertaken is useful – but we must be able to say more precisely under what circumstances and for what digital objects each is useful. Underpinning all this is the revised OAIS Reference Model.